Climate change is underway, and human activities such as urbanisation, industrialisation and food production are key contributors. Food production alone accounts for around 25% of global carbon emissions. Ironically, the changing weather patterns and more frequent extreme weather events resulting from climate change also put the world's food supplies at risk. Food production drives deforestation, meaning there are fewer trees to absorb carbon dioxide, which contributes to the greenhouse effect. What’s more, the fertilisers and pesticides used to protect crops have caused a dramatic decline in insect populations, and in soil fertility, by affecting the microbial organisms that enrich the soil and enable plants to gain nutrients. At the same time, the world population is rising and there are expected to be more than 9.5 billion people on Earth by 2050. In response to these projections, the UN’s Food and Agriculture Organisation (FAO) is campaigning for a 60% increase in food production by 2050, by intensifying agriculture to be more productive and use fewer resources, all without increasing the amount of farm land. It’s not yet clear exactly how this “intensification” should happen. Alternative methods, such as organic farming, are respectful of soil ecology and insect life and can restore soil fertility. But they cannot, at present, produce as much food as industrial agriculture. Yet the idea that we need more food is debatable. Although, according to the FAO, there are 821m people globally suffering from hunger, the world produces 50% more food than is needed to feed the global population. Another estimate from biologist and author Colin Tudge suggests that the current food production can feed as many as 14 billion people. But one third of this food is wasted because of distorted supply systems, unjust food distribution and unhealthy and unsustainable diets. So, the efforts of experts in the food sector should not concentrate on agriculture intensification, but rather on strategies to change patterns of consumption and waste at a local and global level. My own research on urban agriculture and sustainable cities suggests there are three main areas where effective changes can be made. Food consumption needs to become “circular”. This means that organic waste such as food scraps does not go to landfill, but is instead transformed into compost (which will be needed in a transition to organic agriculture) and biogas. At present, organic waste is only recycled to a small extent, with some countries such as Germany and the Netherlands leading, while others including Italy and Belgium lag behind. But there are new technologies emerging to make this process easier. For example, the Local Energy Adventure Partnership (LEAP) has created an anaerobic digester designed for an urban context: this machine can transform organic waste from residential or commercial buildings into compost and biogas that can fuel urban food growing. Some experts also suggest that some food waste – if treated properly – could be used as animal fodder: a practice currently forbidden on hygiene grounds. If reinstated, this measure could reduce the environmental impact of grain cultivation, as less is grown to feed livestock. Another option is to decrease demand for agricultural land by growing food in cities, where more people need it, thereby reducing the distances food has to travel. This would also allow producers to map and match consumers’ demand more effectively, by producing close to the places where food is consumed. 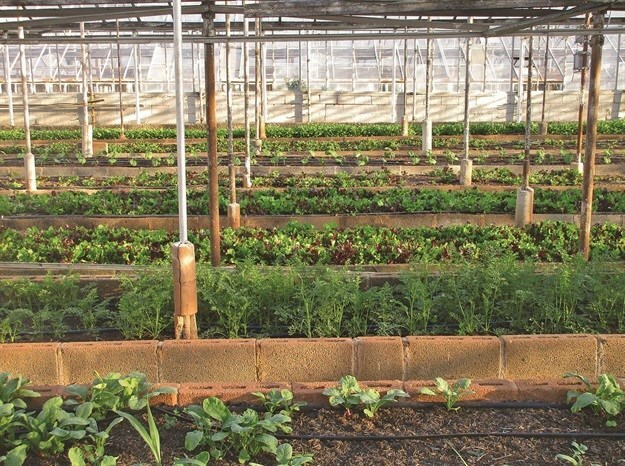 There is a lot of research on urban agriculture and how cities can support it, spanning from vertical farms - hydroponic systems enabling cultivation on vertical surfaces - to principles for planning cities that facilitate the use of land, rooftops and other spaces to grow food into a continuous green infrastructure. In this area, too, it’s possible to find innovations designed to make urban farming easier and more sustainable. For example, The Farmhouse is a modular housing system suitable for vertical stacking that enables all residents to grow food. And Blockchain Domes is a patented system that uses excess heat from computer servers to provide optimal thermal conditions for greenhouses in colder climates. The third option is to encourage people to change their diets. Growing middle-income groups in developing countries are consuming ever higher quantities of meat, cheese and eggs. In China, since 1990, consumption of beef and poultry has quadrupled. But the diet of farmed animals is heavy in grains, which instead could be used to feed people more efficiently. Also, cattle farming requires vast quantities of water and grassland, sometimes obtained through deforestation. Getting people to eat less meat will help to ease the pressure on the world’s food system. In cities, governments, research institutions, communities and businesses can collaborate on food initiatives to give people healthier, cheaper and more sustainable choices – but this requires political will and organisation between different levels of government. Clearly, each of these approaches has a limited scope of action, compared to agricultural techniques or strategies which can be deployed at an industrial level. But with so many promising proposals, there can be a many-pronged approach that that makes efficient use of the existing resources in cities, while also changing consumers’ habits. Together with these three changes, more effective policies for food justice and sovereignty can establish fairer food supply chains and more just distribution of food around the world.